Happy Halloween! 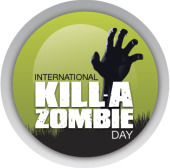 In celebration of International Kill-A-Zombie Day which, apparently, I am the only one celebrating this year (c’mon Sophos, bring it back….Please?) I present to you a neat video on how you can join the fight to kill the zombies that have taken over millions of PCs.